Join The Dog Meat Trade Awareness Campaign - Please Support The Efforts In Getting This Trade Stopped Once And For All. "LOVE4DOGS" campaign was created to raise voices worldwide to help fight the cruelty and barbaric actions of the ILLEGAL DOG MEAT TRADE. Our aim is to not only form a union of voices to speak out against this trade, but to also save lives and raise awareness on the dilemma that is claiming & torturing an estimated 18 MILLION dogs a year. Every day countless dogs are being raised on "dog farms", stolen or picked up in order to fill the hunger of those that crave man's best friend - and due to this demand, these poor animals are crammed in small cages together, and await their fate of extreme torture & suffering --- and many of the world are turning away from their cries & pleas for help. We are asking everyone to please take a moment on OCTOBER 4th, 2014, and show your LOVE for these companion animals, to help us reach out to the Governments of these countries to strengthen & carry out the laws in place related to this trade, to improve enforcement of laws, and permanently prohibit this cruel trade immediately. 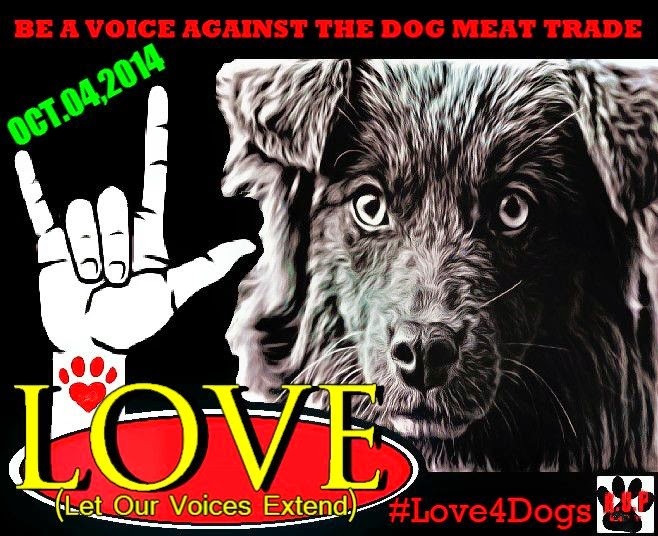 Please Spread The Word So More Will Become Involved, and Participate In Being A Unity of Voices for "LOVE 4 DOGS"